I'm a year late with this one. But do you know why a cablecar was built where it was? Events were set in motion in 2008 when the Mayor decided not to pursue plans for the Thames Gateway Bridge, but instead decided to investigate the provision of alternative river crossings for pedestrians and cyclists. TfL produced a 61 page business case, and this recommended that a cablecar be built between North Greenwich and the Royal Docks. A Freedom of Information request released the report into the public domain last November, and you can read the whole lot (bar some financial detail) if you like. Alternatively, here's the report's conclusion with some commentary. One reason that the cablecar's been built is forward planning. The three aforementioned boroughs are due to grow in population by more than 20% by 2031, with a lot of that additional housing near the riverside. A new crossing would be really useful. 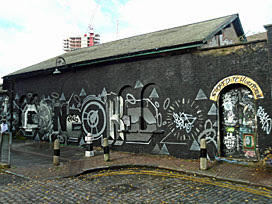 But one connection could only link two of these three boroughs, and in what follows, the Isle of Dogs misses out. • A new link to the Royal Docks would provide much greater resilience to the Greenwich Peninsula, encouraging investment to bring new jobs and homes to the area, and would link two areas of potential complementary growth. A key issue was resilience. By rail there's currently only one way across the Thames from North Greenwich, and that's the Jubilee line. When this goes wrong the only way across the river is by boat or by 108 bus, and these services can't handle large numbers of passengers. Another link would allow visitors to escape the O2 more easily, and also make people more likely to live and work here. The Royal Docks got the nod over the Isle of Dogs because this would create a completely new connection, rather than simply duplicating the underground. It might also help create a cross-river entertainment destination and development zone. A range of potential options has been considered to address the need for improved crossings, and a cable car has the potential to provide a new crossing from the Greenwich Peninsula, which meets the geographic constraints at a much lower cost than a footbridge, and would deliver pedestrians and cyclists to the area around Royal Victoria, which provides opportunities for complementary development linking the leisure hubs of the O2 Arena and ExCeL. Five different options for a new river crossing were reviewed, in some depth. 1) Do nothing: This would have been OK for a few years, but would have restricted local development in the longer term. 2) New/improved passenger ferries: A ferry link from the western banks of North Greenwich to the eastern side of Canary Wharf would be much more direct than the existing Clipper service, but there'd be a long grim walk at each end. Future development will change this, so TfL didn't rule the idea out completely. 3) New foot/cycle bridges: A new bridge sounds like a great idea, but would be very expensive to build because the Thames is a working river and around here it's very wide. 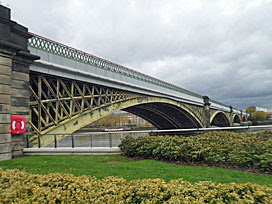 A 50m-high permanent bridge would require expensive lifts or escalators. A low level lifting bridge would need regular lengthy closures. A transporter bridge would have high maintenance costs. TfL could have made this a toll bridge to help recover funding, but that would have deterred most people from using it. A bridge option was not recommended. 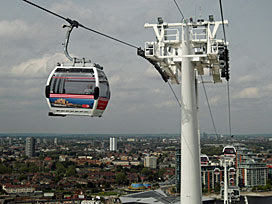 4) New cable car: "It could traverse the Thames without the need for a long and heavy structure such as a bridge deck, allowing cost savings; it could link the key attractors more directly without the need for pedestrians to follow a long walk through industrial areas; it is an attractive proposition to seek commercial sponsorship and raise advertising revenue; and it would be possible to charge passengers for its use, thus making a contribution to maintenance and operating costs." 5) Amphibian bus service: Seriously, that was option five. But with the need to use existing slipways, the route would be circuitous and slow, hence a very unattractive alternative to the Jubilee line. Again, not recommended. So the cable car option won out, being direct and relatively cheap. But where to build it? Nine different alignments were considered in an attempt to find an alignment that avoided existing or future residential development. Some passed too close to people's windows. Some would have required oversailing of buildings, requiring land rights to be acquired (at a cost) in case an emergency evacuation was ever required. Two landed too far away from a station on the northern side. In the end only one route was acceptable, the route that was built, and future development in Silvertown will be tweaked to leave a clear line underneath. Furthermore, a cable car would be an innovative scheme offering a spectacular view of London’s Docklands, and is likely to provide a point of interest for those already visiting the O2 Arena and ExCeL, making these more attractive destinations for events. In addition, it is likely to attract some new visitors to the area, who would be likely to visit other local attractions; this would create new secondary jobs in the local area. The business case forecasts 1.3 million visitors riding the cable car in 2013 - 90% of them as an addition to their day out, and 10% as the main focus of their visit. I suspect the latter percentage will turn out to be an underestimate. In contrast it predicts 678,000 public transport users, suggesting that tourists will outnumber genuine passengers by two to one. That makes a total demand of about 2 million passengers a year, rising to 2.6 million by 2021. The initial forecast equates to around 5500 passengers a day, or just under 40000 passengers a week.... which, interestingly, is pretty much what the cablecar is delivering at the moment. In its first year of operation the report predicts 930 pedestrian trips per day, each saving an average of six minutes compared to the tube/DLR trip they would have made otherwise. The equivalent total for cyclists is 670 trips per day, but with a much greater time saving (28 minutes) because it's so far from North Greenwich to the nearest foot tunnel. Added together that's the equivalent of 120 public transport users per hour, or two every minute. 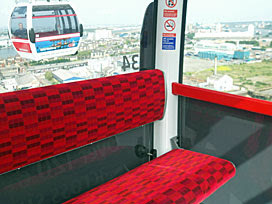 The cost of the cable car is significantly less than a footbridge, and its ability to attract users who are visiting the O2 Arena or ExCeL, or especially to visit the cable car, allows revenues from these visitors to contribute to scheme costs. It is also likely to attract secondary revenue from sponsorship opportunities, due to its innovative nature and high profile location on the Rover Thames. The central case has a Benefit:Cost Ratio of 2.7:1, delivering transport benefits (captured within this business case) and wider economic benefits (which are not captured within this ratio). That's a pretty good ratio, and that's what will have encouraged TfL to construct the cablecar. We can't identify all the costs because part of the report has been redacted, plus this is an 18-month-old planning document and therefore likely to be inaccurate. But the numbers didn't rely on sponsorship. "A conservative assumption has been made that TfL would be responsible for the full capital costs." Emirates' funding is seemingly a bonus, not a necessity. Given the uncertainties around demand and impacts, the scheme impacts should be monitored, and the operations and fare structures kept under review, to ensure that the right balance is maintained between delivering local benefits and providing overall value for money for TfL. Let's hope this last paragraph is heeded, and somebody reviews the fare structure downwards or allows those with Travelcards to ride for free. But the business case suggests that's not going to happen. Passenger numbers may be low, but they're very much in line with forecasts which always expected that this would be the case. Bosses hoped the new link would be "in local transport terms, equivalent to the number of passengers using the DLR to/from Beckton." And so it's turned out, even if it's curious tourists who are making up the numbers rather than pedestrians and cyclists. If the cablecar looks mostly empty, that's because it was always planned that way. James is the conference organiser, so he gets to go first. He reminded us that self-service checkouts were first trialled at Marks & Spencer in 2002, rolled out to 11 stores by 2003. A decade later 65% of the population would like to see more, but that doesn't stop shoppers like Will123_ being angered by them. James provided a 7-step guide to using self-service tills, including the iniquities of trying to purchase alcohol, and the ease with which any machine can be fooled into charging for mere cup mushrooms instead of portobello mushrooms. Despite a polite email, NCR apparently refused to divulge why the "bagging area" is so named because this information is confidential. Many punters forget to take their receipts after purchase, so James ended with a gallery montage. Peter started by acknowledging that front doors contain apertures wide enough for a cat but not tall enough, through which a variety of paper-based items may be pushed (inner portcullis permitting). In July 2011 he collected all 90 items posted through his letter box, weighing a total of 3080g, and catalogued them by type. 51.1% of his mail was addressed, and 8.9% related to takeaway food, mostly pizzas. He interspersed his talk with charming selections from an incident diary he kept whilst a postman in the West Midlands. Imagine a bloke with sandwich-sized sideburns and a Rupert Bear scarf skating repeatedly around the hall whilst a disembodied voice reads from a catalogue of weights and measures. That's ten minutes of my life I'll never get back. Ed grew up without a toaster, so had to make do with grilled bread (and the occasional toast rack in a hotel). He showed us how to avoid excess condensation by creating a "toast tent". Cooling primes the toast surface for buttering, which in turn optimises glazing with a thin layer of jam. Ed had encouraged his Twitter followers to send him photos of bread toasted on setting number 4, which he was then able to rank graphically in order, with a cheap Asda brand performing worst. He then proposed a simpler scale for toasters, a bit like that found on an iron. This would rise from 'warmed bread' through 'pitta', 'sliced bread', English muffin' and 'sourdough' to 'German rye bread'. Yay for toast. Running contrary to the theme of the conference, Rose chose to talk about the least boring object in your house - the toilet. In-house sanitation has added 20 years to our life expectancy, although 2.6bn people still have no toilet and this kills one child in the developing world every 15 seconds. She advised us to wash our hands after handling five pound notes, but declined to tell us about the iniquities of toilet paper. In China, human waste is called nightsoil; in Sweden, it powers cars. Rose urged us to go home and hug our toilet, which may be true but isn't really what you want to hear before lunch. The PSR-175 was launched in 2003, costing £100 and measuring 931mm×128mm×349mm. Unlikely features included a calculator, a dictionary and a 'DJ' button used to interject hip-hop phrases into the mix. The latter was ably demonstrated, along with the non-variable volume function. 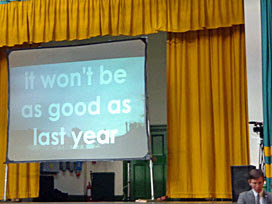 Helen's talk was a fine example of an utterly pointless topic brought to life by entertaining discourse. Greg is in no way insecure about being five foot four, and so shared his fascination for a website where men obsess about the heights of famous people to the nearest quarter inch. Daniel Craig is 5'10.25", apparently, while Nicholas Parsons is fractionally taller. Various obsessive exchanges on the forum were held up for polite ridicule, leading Greg to wonder whether all this pseudo accuracy was really a smokescreen for the discussion of masculinity. If the first celebrity chef was Gross Guillame, a 19th century French baker with a floury face, then Gordon Ramsay and Greg Wallace are merely continuing an age-old tradition. Charlotte was especially unimpressed by the increasingly unrealistic expectations of Messrs Oliver and Blumenthal, and attempted to prove (graphically, exponentially) that 2019 will see the publication of Jamie's One-minute Meals. Yellow lines have their origin in the Slough Experiment (1955-57), the attempted creation of a "Safety Town" in the Thames Valley. Use of lines for parking restrictions caught on, whereas the Accident Beacon at Crown Corner (which lit red for a week following any fatal road accident) was not repeated elsewhere. Yellow lines are made from chalk, oil, paint, sand and glass beads, in appropriate proportions, and have to be tested for reflectivity, skid resistance, luminosity and durability. The average yellow line lasts three years. Andrew's focus was compromised somewhat by a diversionary investigation of the Festival of Britain, but he provided a poetic elegy to these peripheral urban territories. James Brown founded Loaded magazine, no less. He told us why he really enjoys the multi-faceted format-pile-up of a late-afternoon TV schedule filler. In the breaks, Richard DeDomenici encouraged attendees to try to break the world record for the highest number of rotations in a single self-propelled spin on a standard office chair. James did just that, with a new high of 30.5. As a numerically obsessed London commuter, Elise has invented a game to play with the numbers on tube carriages. She splits them in two, adding or multiplying the digits, and if they can make equal totals then she's happy. 42015 works, for example, because four and two and zero, and one and five, both make six. She calls them 'Elise numbers', which isn't a proper branch of mathematics, unlike Vampire numbers which have gained a toehold on respectability. These are numbers whose digits can be evenly split, then juggled and multiplied to make the original number, for example 1260=21×60. A brave choice of topic, especially with no visual aids, but I rode home in District line carriage 7025, and that made me smile. Emily's been taking photos of London Shop Fronts since 2004, and now has a collection of over 1000 on her website. She has rules. No cars or people must get in the way, and all photos are to be taken straight on, full frontal. In many cases the shops have already disappeared, or changed beyond all recognition. And they're lovely photos - a documentary record of the city as it's lived in today. By putting all the really interesting inventions together in the Making Of The Modern World gallery, Alice argued, the rest of the Science Museum has become even more boring. Although the Secret Life Of The Home gallery in the basement is pretty ace, especially the teasmaids. And the fridges. We nearly all ended up with gas fridges, you know, except the electric fridge lobby promoted itself better. And that's why your fridge needs a motor, and why it hums. James used to live in Tower Hill and work in Soho, and decided to stay vaguely fit by walking 3.3 miles to work rather than taking public transport. That's 7152 steps, which he used to manage in just under an hour. Recently he recreated that commute, and his peculiar habit of attempting not to swallow any saliva along the way. Exceptionally mundane stuff, lifted by his final uplifting coda urging us to walk more and connect with our environment. ...Tesco? Burnt Oak, Middlesex, 1931: I wrote about this yesterday. 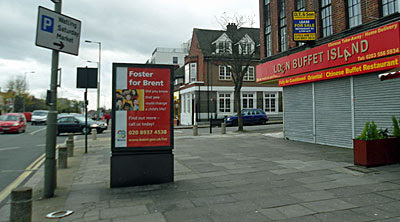 A second store was opened around the same time in Green Lane, Becontree, Essex. ...Sainsbury? 173 Drury Lane, Holborn, 1869: I wrote about this in 2005. 173 Drury Lane had five floors which included the shop, an attic and a basement (where the food for the shop was stored). The Sainsbury family shared the premises with three other families. Early trading was in dairy goods only, brought in by train from Devon, Dorset and East Anglia. There's no number 173 any more, alas, just a rather nasty office block. 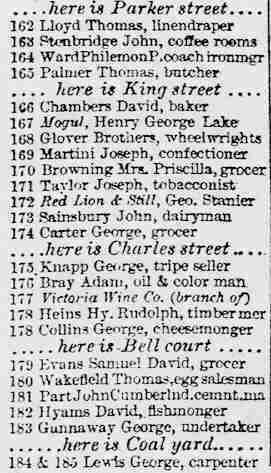 A second store was opened at 159 Queen's Crescent, Kentish Town in 1873. Half a floor at the Museum in Docklands is given over to the Sainsbury Archive, with free public access. ...Waitrose? 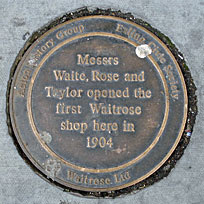 263 Acton Hill, Acton, Middlesex, 1904: The grocery store opened as Waite, Rose & Taylor, named after the three founders, but renamed itself Waitrose four years later after David Taylor left the business. The company was taken over by the John Lewis Partnership in 1937 when there were only 10 stores - today there are 280. 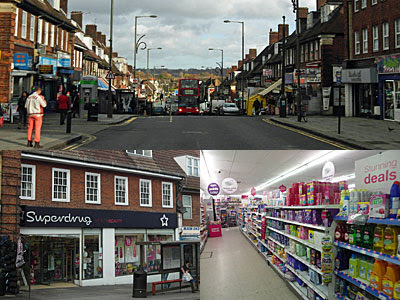 The first Waitrose supermarket opened in Streatham in 1955 with 2500 sq ft of selling space. The original store in Acton is now a tacky pizza takeaway, with a commemorative plaque on the pavement. ...Asda? Leeds, 1949: Founded as Associated Dairies & Farm Stores Limited, then merged in 1965 with the Asquith chain of supermarkets to form Asda - an abbreviation of Asquith and Dairies. ...Booths? Blackpool, 1847: Started out at The China House, opened by 19 year old tea dealer Edwin Henry Booth. ...Budgens? 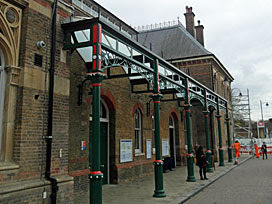 Maidenhead, Berkshire, 1872: Founded by John Budgen. 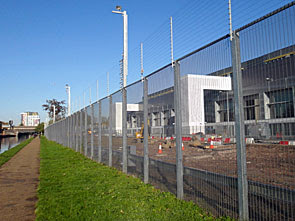 Their HQ is currently in Harefield, which is one of the few locations in London to be more than two miles from a Tesco. ...Co-Op? Rochdale, Lancashire, 1844: First established by the Rochdale Pioneers Society. One of their eight 'Rochdale rules' was to distribute a share of profits according to purchases... which came to be known as 'the divi'. You can now book a visit to the Rochdale Pioneers Museum. ...Iceland? Oswestry, Shropshire, 1970: And there was you thinking Reykjavik. 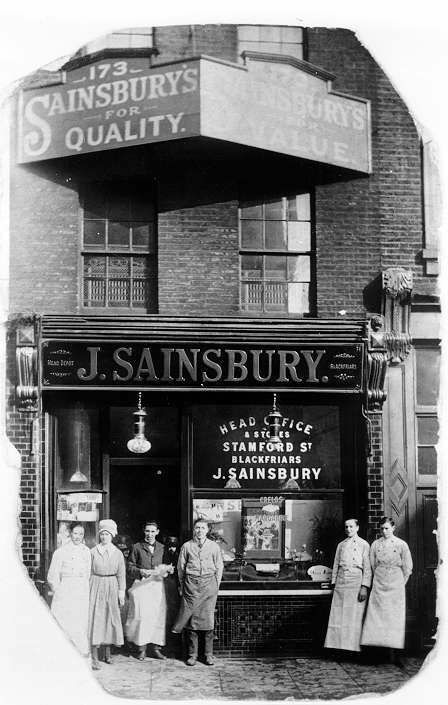 The first store specialised in selling loose frozen food, because domestic fridges and freezers weren't yet commonplace. ...Londis? somewhere in London, 1959: The name was a contraction of "London District Stores". ...Marks and Spencer? 20 Cheetham Hill Road, Manchester, 1894: The first shop was in Manchester, although Michael Marks' original Penny Bazaar was a stall on Kirkgate Market, Leeds. ...Morrisons? Bradford, 1958: The company is much older, founded in 1899 as an egg and butter merchant in Rawson Market, Bradford, under the name of Wm Morrison (Provisions) Limited. ...Bejam? Stanmore, Middlesex, 1972: Yes, apparently Stanmore. I'd love to uncover some more evidence. ...Liptons? Glasgow, 1871: Turned into Presto, turned into Safeway, turned into Morrisons. ...Presto? Prestonpans, East Lothian, 1977: Obviously. ...Safeway? Bedford, 1962: I used to do my weekly shopping there. So, where in London is furthest away from a Waitrose? These are distances by road, rather than in a straight line. Did I miss anywhere important? It ought to be a quiz question. Where was Britain's first Tesco? Answer? 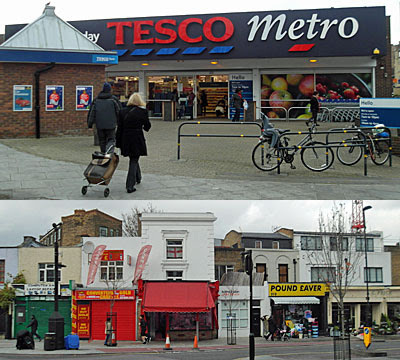 The first Tesco store was in London, but probably not anywhere you're expecting. It was in Burnt Oak. Quick, before you reveal your geographical ineptitude, Burnt Oak's located where Barnet meets Harrow meets Brent. On the A5, that's Watling Street, between Hendon and Edgware. 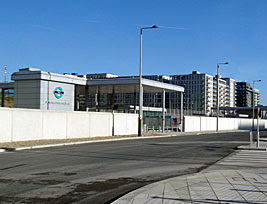 One stop past Colindale on the Northern line, one station before the end of the line. Some of these facts will turn out to be important. Now back to today's post. The man behind Tesco was Jack Cohen, a former soldier from the East End. After WWI, he spent his demob money buying surplus NAAFI groceries, then sold them on in local markets. His initial plan was to visit a different market each day of the week, and the first he picked was Well Street Market in South Hackney. He set a few goods out on a table and they were soon snapped up - sold for £4, of which £1 was profit. Gradually his business grew, sucking in non-family members, eventually diversifying into an own brand tea. The TES in Tesco comes from TE Stockwell, the merchant who supplied Jack with that tea, and the CO comes from Cohen, Jack's surname. Small roots. And so to Burnt Oak. In common with much of Middlesex suburbia this used to be all fields, although the presence of a turnpike road helped a minor settlement to grow up. In the 1870s there was just one shop, by the turn of the century a few more, but nothing of any importance until the railways came. The arrival of the Northern line in 1924 inspired the London County Council to build a large estate for the rehousing of slum dwellers in Islington. This was the Watling Estate, built across Goldbeaters Farm, and a fresh clutch of shops were needed to serve the growing population. The first opened up by the Broadway, eventually stretching in a long parade down to the fledgling station. And it was to Burnt Oak that Jack Cohen turned his gaze when seeking to open his very first store. "Tesco Stores Ltd The Modern Grocers" said the sign on the shopfront, while the window was stacked high with pyramids of tinned goods and packets of Tesco Tea. The parade of shops down the hill survives, even thrives, although more with discount stores than anything too upmarket. Superdrug itself is sandwiched between a clothes shop and a continental food store, the latter much more varied than the first Tesco ever was. And no, they didn't go far, just a couple of hundred yards round the corner onto Burnt Oak Broadway. Again the Tesco School of Architecture has built an ugly but functional cuboid, in sharp contrast to the former Co-Op across the road (once described as their "finest department store"). This Tesco is eight aisles wide, stretching back all the way to the car park, and considerably easier to push a trolley around. As Jack's empire has grown, so has his very first store, but I doubt that many in Burnt Oak realise the significance of their weekly shop. In South Hackney I pass Vietnam's Finest Nail Salon. It's definitely not. In Moorgate, Crossrail intrudes. A large group of workmen are sitting in a row outside a cavernous construction site, chatting and smoking fags. In the old days this would have been called a tea break. In the Barbican, the queue to enter the Rain Room is already fifty people long. It doesn't open for another half hour, and this is only midweek. Not today, then. In the Museum of London, half a dozen school trips are making their way around the building. One teacher is trying ever so hard to keep her little darlings quiet before they go in, but Alfie isn't having it. Another group is behaving impeccably wandering around the Medieval London gallery with clipboards. Downstairs a gentleman in a top hat is introducing himself to a class of children, but they don't seem to have cottoned onto the fact he's Mr Charles Dickens and are making an excitable racket. It's not the best day to be looking round. In Burnt Oak, the wind is so strong that the letter 'O' flies off the front of the Golden Buffet Island restaurant and lands on the pavement near the bus stop. One of the 'E's, or maybe the 'A', look like they'll be next. In Watford, next to what used to be the Post Office, I get round to buying a new camera. It's no expensive SLR, just another point-and-shoot, but I'm looking forward to dumping my crappy Samsung brick at the earliest opportunity. 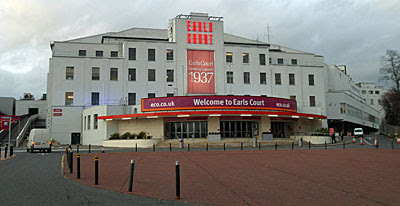 In Earl's Court I walk around the edge of the doomed exhibition centre, amongst delegates emerging from Pet Ex 2013. I incorrectly assume this is a gathering of animal lovers, whereas in fact it's a petroleum industry love-in. Signs outside give the dates of next November's expo, but not the location, which probably won't be here if the demolition men have moved in by then. Just how many more prestige housing developments does west London need? In West Acton I stop for a cup of tea and discuss the new tube map. Apart from the orange loop, and a couple of step-free stations, there doesn't appear to be anything different to the last one. In Ealing I'm taken for a guided tour of 2011 riot hotspots, including a murderous alleyway and a boarded-up cafe that's never recovered from the night's destruction. In Bow, it pisses down. The people of Leyton have had to make do without Drapers Field since September last year. A few acres of all weather football pitch and playing fields, it had the misfortune to be immediately adjacent to the Olympic Village and so was requisitioned by LOCOG "for operational reasons" to store toilet rolls and the like. Now all that remains is excess fencing and excess tarmac, as Waltham Forest prepare to take yet more months to turn the place into a better facility than before. Security guards no longer gaze intently if you linger at the end of Crownfield Road, but the park still hangs somewhat unwelcomely over these perimeter streets. Direct pedestrian access from the east to Westfield has at last been opened up. You'd never guess from the blue sign that still directs those on foot via the previous loopy detour, but ignore that, walk up the direct pavement and you'll save five minutes. Penny Brookes Street is more a conduit for big-booted cars, even on a Sunday morning when most of the shops aren't even open. You can see hundreds of premature arrivals wandering the malls before noon, staring through the big stores' shuttered doors, wishing they'd stayed at home a bit longer. At the northern end of Westfield an ice rink has appeared where Santa's house was last year, and Santa's house has reappeared alongside the station. Stratford International has returned to being a woefully overstaffed nomansland, even though it's now finally been connected to the public road network. A new road has opened, unimaginitively named International Way, which I appeared to be the only person using at the weekend. It's five and a half years since I first saw a road sign pointing towards this station, and only post-Olympics is this unwanted link finally possible. The road along the boundary between Westfield and the Olympic Park is now a conduit for traffic heading multi-storey-ward. Gone are the queues of spectators clutching tickets, and gone are all the tents where the army stood to frisk them down. Few places scream "The Olympics are over" quite as much as this utterly empty plaza. Where people once streamed to the horizon, now it only takes two security guards to stand by the fence and keep nobody at bay. That was Sunday, anyway. On Monday Rihanna turned up on a temporary stage and pouted her way through her new album, then switched on the mall's Christmas lights, and the place was rammed. Some wit at Westfield has named this featureless tarmac "Cherry Park". Not yet it's not, nowhere even close. The best views of Olympic Central are still from Montfichet Road, the street on stilts snaking down to the railway. Look, the wings on the Aquatic Centre are coming down. It's a slow process, but the steep seats have now been exposed sufficiently to create a wind tunnel from one end to the other. All the wrap's been removed from the exterior of the Olympic Stadium, as it sits there waiting for someone, anyone, to finally decide what to do with it. And the Orbit, probably still a year and a half off taking its next paying customer, stands inert and useless above a grey desert. One day, honest, it'll be amazing again around here. That day remains some way off. Warton Road's security checkpoint has finally been dismantled, which would be to motorists' joy had not temporary traffic lights been installed instead. One dilapidated brick office block with smashed windows has somehow survived Olympic rehabilitation, while everything else around it has become flats flats flats. A 43 storey residential tower screams "Stratford has changed" to the surrounding boroughs, and looks down haughtily upon local residents who'll never be able to afford to live in it. The footbridge over Stratford High Street isn't long for this world. The stairs at each end have already been removed, then the weekend after next a crane arrives to loosen it and cart it away. Recyclable, sustainable, forgettable. Let's end by diverting up Marshgate Lane to Pudding Mill Lane station. Once a main route in for Olympic construction traffic, then an entrance for VIPs, now the engineers at Crossrail hold sway. They're diverting the Docklands Light Railway south to make way for trains emerging from underground, which means a new viaduct and a relocated station. The latter's coming on, in a concrete cuboid way, while the new tracks doesn't seem to have extended since worked paused in the summer. From the existing platforms the stadium's clearly seen, while the warmup-tracks across the Greenway have now been wholly and utterly wiped away. 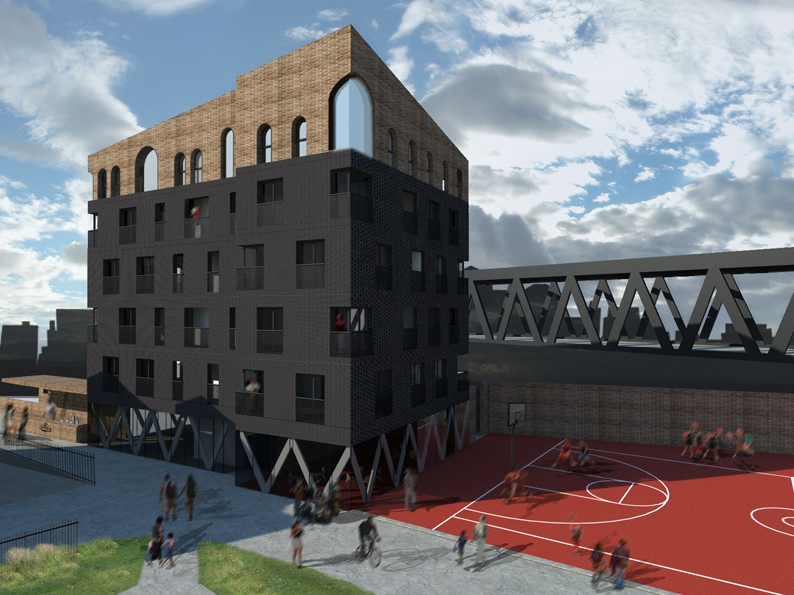 More flats are going there, obviously, eventually, although it remains questionable how few of them will be affordable. And there's the View Tube, access beneath the mainline still sealed off, but maybe opening again in ten days. Knock hard enough, and they'll have to let us back in eventually. It was a lovely day on Sunday, so I went for a walk around the Olympic Park. Sorry, I do this far too often. I took several photos on the way. Sorry, I do this far too often. And now I'm going to tell you all about it, even though you're not really interested. Sorry, I do this far too often too. But until they let people back inside the Park again, what do you expect? At least the photos are very pretty this time, with a lot of watery reflections. I promise not to walk round again until at least 2013. Apologies. Welcome once again to the Bow Roundabout. It's a year now since cyclist Svitlana Tereschenko met her death on the westbound approach, and her white ghost bike has been reinstated on the railings in memoriam. Brian Dorling's ghost bike languishes beyond McDonalds, moved out of the way (with permission) in the spring, but never moved back. Someone's finally got round to cutting back the vegetation on the ramp to the floating towpath, so it's less like a jungle down there. Half of the temporary security gate across the Lea has been removed, but not the locking bit alongside the towpath which may be here for the duration. And Crossrail are intruding more, having knocked down more of the industrial units over the right-hand wall, and filled in more of their cofferdam in the river with pebbles. With the ground strengthened they can start digging the Pudding Mill Portal underneath, but it'll be at least six years before you'll be able to follow. Something about the weather is perfect - blue skies, no wind - so the surface of the river is as still as the proverbial millpond. 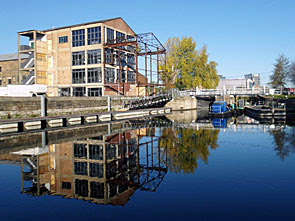 Add in the total lack of green algae at this time of year, and conditions are just right for mirrorlike reflections. It's impossible to see the Olympic warm-up track over the fence, if indeed it's still there, and still impossible to walk up the ramp onto the Greenway. Everything to do with scanning machines was removed several weeks back, so now all that remains is an unnecessarily large expanse of concrete surrounded by razor wire. Allegedly public access will be returned to this strip of Greenway in December, possibly even the first weekend in December, but as yet there's no tangible evidence. Even the View Tube's website remains resolutely offline, offering no clues, but presumably they'll be serving up frothy coffee to post-Olympic tourists soon. The sunlight rippling underneath the Greenway is as good as I've ever seen it, if sewage transference tubing can ever be deemed beautiful. Almost nobody's here, bar the occasional jogger and flurry of cyclists. The waterbus stop at Old Ford Lock lies empty, as it has done ever since Water Chariots went under, and there's no sign of any alternative provider nipping in to run a pleasureboat replacement. The lock itself is sealed off, pending off-season renovation, so the winter moorings just to the north are being well used. Woodsmoke belches from a small chimney aboard one characterful narrowboat, while well-wrapped diners on a pontoon across the river tuck into their fried breakfasts. There's still much to enjoy around here, even though the five ring circus has left town. And it really has left. Previously this stretch of the riverbank was overshadowed by a line of stacked-high prefabs housing the London 2012 sponsor village, but that's now been entirely dismantled. Instead there's a perfectly clear view of the Olympic Stadium - the closest you can currently get to it - apart from the obligatory security fence and cameras. Since I was last here it's noticeable that almost everything temporary has gone, anything that might have held a TV studio, restaurant or backroom. This was the powerhouse of the commercial side of the Games, but all that now remains is a very long very empty space. This bit won't be part of the post-legacy park, it's just outside, and is destined to be built upon (eventually) for apartments. Enjoy the unobstructed view while you can... it'll last a year or two more, then disappear forever. At White Post Lane the canoeists are out, fresh from the Eton Mission Rowing club, one group of four and one single sculler. I seem to remember there were once plans for Kings Yard alongside the Energy Centre to become an Olympic Museum once the Games were over, but I fear we can assume that's never going to happen. Again the outskirts of the Olympic Park beyond are blank, as are the entire interior hereabouts bar the permanent Copper Box. One particularly unnerving thing is the disappearance of the 500m-long strip of car parking along the opposite side of the fence. This was shoehorned into Olympic construction plans at the very last minute, despite the presence of a perfectly good multi-storey car park in the corner of the site, reputedly at the request of lazysod broadcasters NBC. Its 150 spaces were then barely used, and now there are diggers breaking them up because they were never meant to be here in the first place. If you're ever on a committee investigating London 2012 budgetary waste, I'd shine a torch here if I were you. Turning right off the Lea onto the Eastway, that multi-storey by the International Broadcast Centre remains echoingly empty. 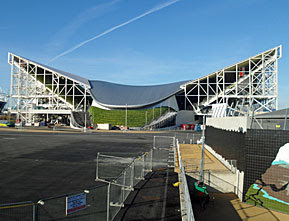 The security tents have disappeared further along, and the Riverbank Arena where the hockey was held has been entirely dismantled. There's not much left of Dan Harris's ghost bike by the A12 junction, but his helmet, gloves and neckerchief have somehow survived the ravages of three months in the open. A more unlikely Olympic remnant is the sloping meadow by the Eton Manor gate, many of its flowers still blooming brightly even in mid-November, if a little worse for wear. Up here along the northern edge of the park a few temporary tents and grandstands are still to be removed, so a workforce is there right now doing just that. The East Marsh remains football-free for another season, now a vast abandoned coach park awaiting grassy restitution. Temple Mills Lane is starting to be used by construction traffic for the East Village, and for Westfield deliveries, but not yet by you and I. Meanwhile round the corner in Leyton you'd never know the Games had been and gone, bar some nicer pavements outside the tube station. And that's only halfway. Sorry. Plans are afoot for a new bridge across the Thames. A new footbridge, that is, between the London boroughs of Wandsworth and Hammersmith and Fulham. It'd be built roughly halfway along a mile-long gap between Wandsworth Bridge and Battersea Bridge, allowing pedestrians and cyclists to nip between the two sides of the Thames without having to make an annoying detour. Sounds like a sensible idea, no? 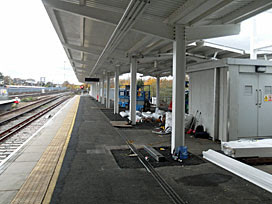 The project takes advantage of the railway bridge that already crosses here, ferrying the Overground between Clapham Junction and Imperial Wharf. Once there's one bridge in a particular location, logic has it, local residents are far less likely to object to the construction of another. Plus it'd be convenient to have the choice of foot, bike or rail to cross the river, especially when this is one of the busiest parts of the Overground and trains can be chocker. The plans have been put forward by a "small, efficient and ambitious" architectural practice based on the Battersea banks of the Thames. They'd be a beneficiary of any new bridge, obviously, but so would thousands of others, and maybe it takes a local eye to spot the necessity of such a project. The "evening economy circuit" would benefit, apparently, as it became easier to visit cross-river restaurants and walk home afterwards. 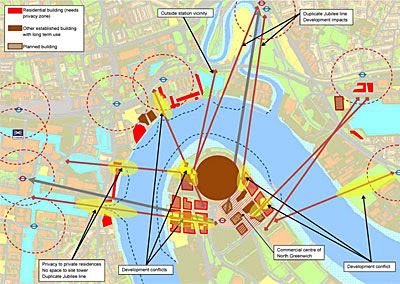 In particular those on the Battersea side of the Thames would be able to cross easily to reach Imperial Wharf station, which otherwise lies frustratingly out of reach, and from there gain access to the rest of the rail network. 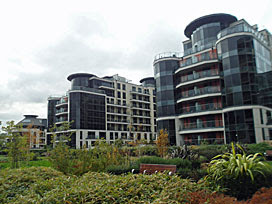 An application for planning permission was submitted last week, and the scheme duly made ripples in the London media. But is this a genuine proposal, or is it just a bunch of architects making a noise in an attempt to get noticed? I headed down to Battersea Reach to take a look, and I have my doubts. The problem's on the Sands End side. 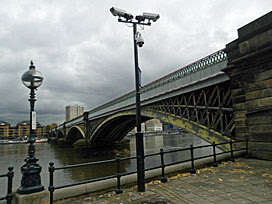 The western end of the footbridge would land in one of the most public-unfriendly parts of the capital, on the boundary between the Imperial Wharf and Chelsea Harbour developments. "PRIVATE PROPERTY" scream the notices on the embankment waterways. "This site is protected by 24 hour security guards and full CCTV coverage." There are cameras everywhere, undoubtedly linked to some paid-for control room, lest any non-resident interloper create too much disturbance within these luxury environs. A lot of very rich people moved to this dead-end location in order to be tucked away inside their own semi-private enclave. The last thing they want is oiks from Battersea traipsing through. The Chelsea Harbour side of the railway has pretty poor public access. The entire site is covered by a labyrinth of luxury apartments nestled around a central marina, and there's no way that would be an acceptable exit for cyclists. One main access road slinks round the back of the site, along the viaduct, but that's not exactly welcoming. "No vehicles except for loading and access." "In the interest of public safety Cycling, Skating and Rollerblading are not permitted." And on the road down to the riverfront "Taxis/Chauffeurs Only." I told you they were posh round here. Management really aren't going to want to make this the main way on and off a bridge. Fortunately the footbridge is due to land on the opposite side of the railway viaduct, on the Imperial Wharf side. Unfortunately several large apartment blocks have been built along the waterfront, all with prestige views, entirely blocking the route to the road network beyond. There's a cut-through 300m upriver, but detouring that far would be annoying, plus cycling's persona non grata around here. The only viable access would be the direct route along the edge of the railway viaduct, except these are private gardens and they're gated shut at the far end. Residents would have to sacrifice their exterior space if this new bridge went ahead, and I'm not sure I can see that happening. There are two piers here, one on either side of the railway bridge. For the Diamond Jubilee Pageant the Queen embarked on her royal barge from the Chelsea Harbour pier, so there are plans to name this the Jubilee Footbridge if it comes to pass. A nice heart-tugging touch, even if anniversary projects are usually designed to open in the specific year rather than two years late. Except the designers would rather not call it just the "Jubilee Footbridge". They propose selling off the naming rights to anyone who can afford £22m, because that would pay for the construction costs so the connection could be "gifted to London at no cost to the taxpayer". Sigh. We appear to have entered an era when paying to get your brand's name on the map of London is deemed wholly acceptable. Britain's football stadia succumbed first, then we got an entertainment venue named after a mobile phone company, and most recently a cablecar named after a Middle Eastern airline. "It wouldn't get built otherwise," is the mantra, "don't you know there's a recession on?" The public gets something it can use, and a brand name is shoehorned into our everyday lives. Alternatively Londoners could pay £3 each to get this new bridge built, in the old fashioned way via fares and taxation, but you get stared at in a funny way if you suggest that these days. Whatever, there is one possibly entertaining result if this particular bit of infrastructure gets a brand slapped on it. Can you imagine how the oligarch residents of Chelsea Harbour would react if this bridge were named something unpleasantly downmarketly inappropriate? The Easyjet Jubilee Footbridge. The QVC Jubilee Footbridge. The Virgin Broadband Jubilee Footbridge. OK, it's not likely. But then the chances of this bridge coming to pass in the first place don't look that likely, given the potential access issues on the western bank. Don't hold your breath. 6pm update: Chris from architects One-world Design has posted a comment, which you can read here, and also emailed me a 4MB copy of the Design and Access statement. That's not yet in the public domain, but soon will be, and includes 46 pages of detailed information about the bridge, its design, and the support it has from the two local authorities. As you'd expect, the detail looks very well thought through. But on the subject of access by Imperial Wharf, all the document says is "Pedestrian and cycle access to the bridge is from the existing riverside walkway on the west bank". So to get to Fulham, a bit of a detour. And to get to Chelsea, a bit where you're forced to get off your bike and walk. Almost very well thought through.